View More In Hunting Knives - Page 3. 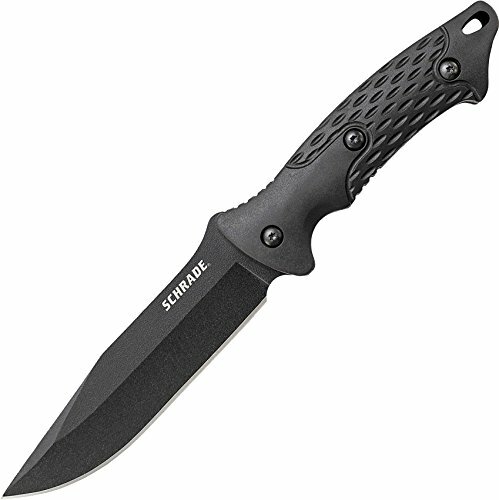 Schrade Full Tang Fixed Blade Knife, Black 8Cr13MoV High Carbon Stainless Steel Clip Point Blade Featuring Thumb Ramp with Jimping and Finger Guard, TPE Handle Slabs with Lanyard Oval, Multi-Carry Option Thermoplastic Belt Sheath with nine grommet holes and four slots for lashing to gear or pack. Multi-Carry Option Thermoplastic Belt Sheath with nine grommet holes and four slots for lashing to gear or pack.